Wales Trails Themed TrailWe're so proud of what we have to offer visitors in Wales that we've developed Wales Trails to inspire you to park the car and explore our fantastic country by train, cycle or on foot. Let's make one thing clear. Wales Trails is not a tool for detailed trip planning - it's designed to help you consider car-free options for a day trip or longer stay. 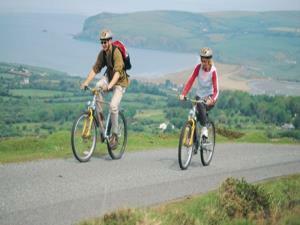 Explore Wales using a combination of train, bicycle or on foot. You may decide to travel by train to a selected point, then walk a section of the beautiful Wales Coast Path or jump on a bike to follow part of a cycle trail before heading back home on a train. We feature three scenic rail trails - Cambrian Coast Railway, Conwy Valley Railway, and Heart of Wales Railway - which travel through breathtaking Welsh landscapes. For cyclists, we have four National Cycle Network trails - Lon Cambria & Lon Teifi, Lon Las Cymru North and Celtic Trail - that offer a fantastic mixture of traffic-free rides and challenging adventures. If you prefer to explore on foot, we have three long distance walking trails: Glyndwr's Way National Trail, Offa's Dyke Path and Wales Coast Path. The app is very easy to use with Trail, Map and Directions icons. Each Trail features numbered hubs or 'Waymarkers', which provide lots of useful visitor information about things to do and points of interest within easy reach. We hope you enjoy using the app. Have fun.